The first floor hall of the Historic Courthouse is a display area for large art works of local significance. Four large murals depicting the history of Burnham, Pennsylvania are on display. 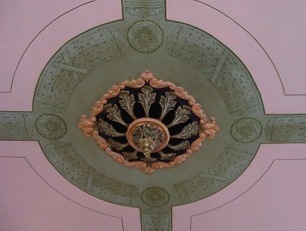 The artwork, by Dr. Yar G. Chomicky , late of Pine Grove Mills, Pennsylvania, was painted in 1952 for the auditorium of the Burnham High School. The murals were donated to the Historical Society by the Mifflin County School District in 1989. In addition, a large mural titled “Kishacoquillas” also hangs in the hallway. This work depicts Kishacoquillas High School and an image of Chief Kishacoquillas above the school. Mifflin County artist Anne Kepler Fisher completed the mural in 1966. It was hung that year in the auditorium lobby of the former Kishacoquillas High School, later Indian Valley Middle School. It was given to the Historical Society by the Mifflin County School District in 1989. There is also a large painting in an ornate gold frame of the William Mann Axe Factory in the second floor community room. Established circa 1835, it is shown in a scenic view of the Reedsville or Mann's Narrows (formerly Logan's Gap.) This painting dated 1905, was signed by C.A. Eshelman. It was presented by the Brooklyn Fire Company. The historic Mifflin County Courthouse finally underwent another renovation, over one hundred sixty years after it was built. With the support of the Mifflin County Historical Society, The Juniata River Valley Visitors Bureau, Juniata Valley Area Chamber of Commerce and Downtown Lewistown, Inc., Mifflin County Commissioners Yogi Laub, Susan Metz McCartney and James Hildebrandt moved forward several years ago to secure state grants to complete the most extensive renovation of the aging building since the 1870s. Besides extensive painting, plastering and new lighting fixtures, the renovation includes an elevator and modern heating, cooling and electrical systems. The 1843 structure emerged as a revised version of the original, still serving the people of Mifflin County. 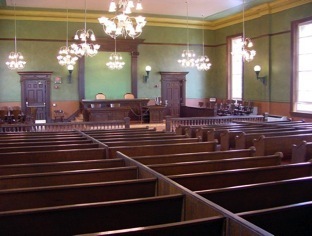 The courtroom on the second floor was returned to a close approximation of the way it appeared in the late 1800s, with the removal of aging air conditioners and installing lighting that imitates the original gas fixtures. 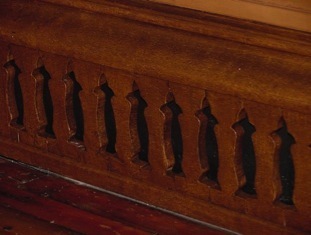 The color scheme of the walls and woodwork will be reminiscent of the courthouse’s 19th century decor. The renovation project began in 2000, was completed during the summer of 2004. 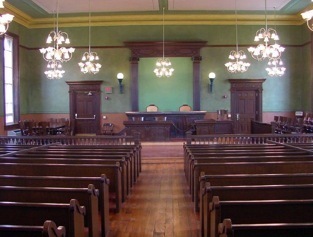 These photos show the central feature in the main courtroom after completion of the 2003 - 2004 renovation project, including the recreated 19th century stenciling. The innovative Wallis system installed in 1879 involved vents along the baseboards, air passages under the courtroom floor, and openings in the ceiling, allowing for the circulation of fresh air. 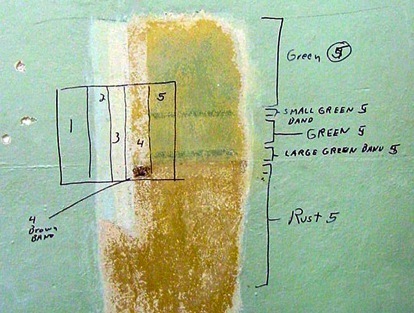 This photo shows an evaluation of the multiple layers of paint in the main hallway of the Historic Mifflin County Courthouse during renovation. “Paint detectives” from the Pennsylvania Historical and Museum Commission carefully scraped through the layers in 2003 until the original colors were discovered. The final paint configuration was arrived at, based in part, on this evaluation. In addition to the Historical Society’s office and research library, the area chamber of commerce and tourist promotion agency have offices in the renovated building. Downtown Lewistown, Inc. also occupies offices in the historic courthouse.